Aquarium filters are one of the most important components within custom fish tanks. In fact, the entire concept of an aquarium would represent a moot point without their presence. Filters are intended to remove toxins (such as organic matter and dirt) from the water; helping to keep the internal nitrogen cycle balanced. Of course, there are many different types of filters to choose from. Some of the most common include internal filters, canister designs and power filters. Each of these configurations still shares a number of components in common. 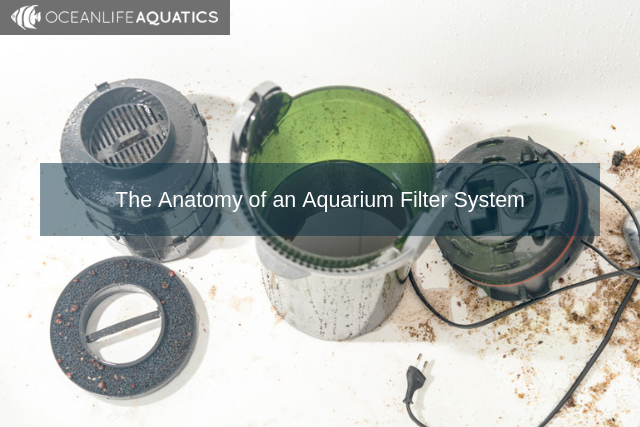 Let us, therefore, take a quick look at the basic anatomy of an aquarium filter. The majority of filters on the market today are equipped with what is known as an air line. This is a flexible tube which is attached to an inlet on the filter. It is normally powered by a pump located outside of the aquarium. As air bubbles are fed through this tube, they will help to create water movement through the filter. The air and water then leave through the top of the unit and return into circulation. The main intention is to separate and remove particulate matter from the water that is injected via the inlet. The last main component is the housing of the filter itself. This structure performs two main purposes. First, it ensures that no contaminated water escapes back into the tank. Depending upon its size, it will also dictate how often the filter needs to be cleaned (larger units tend to last longer). Finally, some housings are clear. This enables the user to determine when the filter needs to be changed. There are many different types of filters on the market today and each is associated with its own set of benefits. If you would like to learn how to choose the correct configuration, it is a good idea to speak further with a representative at Oceanlife Aquatics.